In Brief: Explore the area between Zhuangdaokou and the Walled Village on a slow-paced walk. Walking easy trails through chestnut orchards. 2–3 hours start to finish over 4–6km. 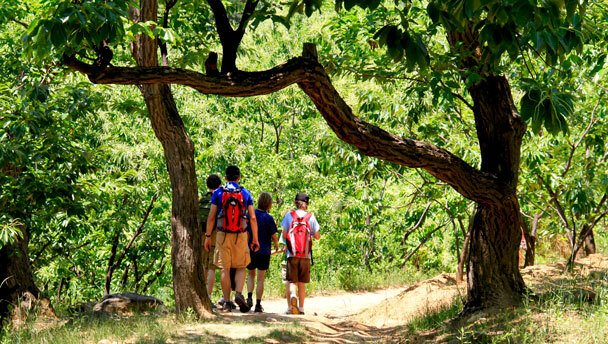 Kids club: relaxed outings for kids to enjoy some family time in nature. Best for ages 5–12. Younger children would need to be carried for most of the way on this. Climb a valley trail to reach the Great Wall at Zhuangdaokou, stopping to explore the wall and surrounding area before an easy, mostly flat, walk over to the Walled Village. While there aren't specially structured activities this time, there are some fun things to do. 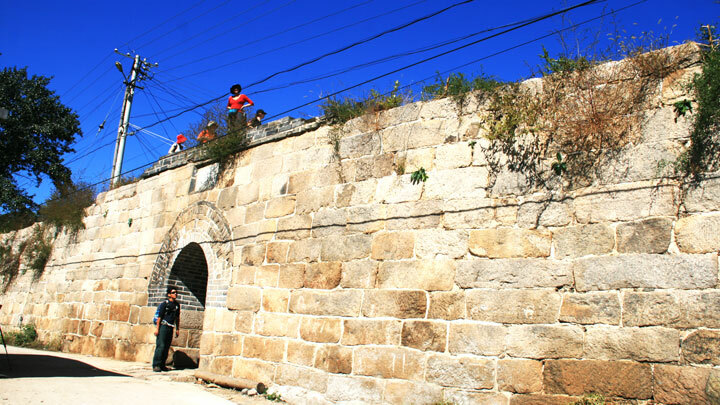 Explore the Great Wall: Climb up to the first tower at Zhuangdaokou for great views. Best for older kids. 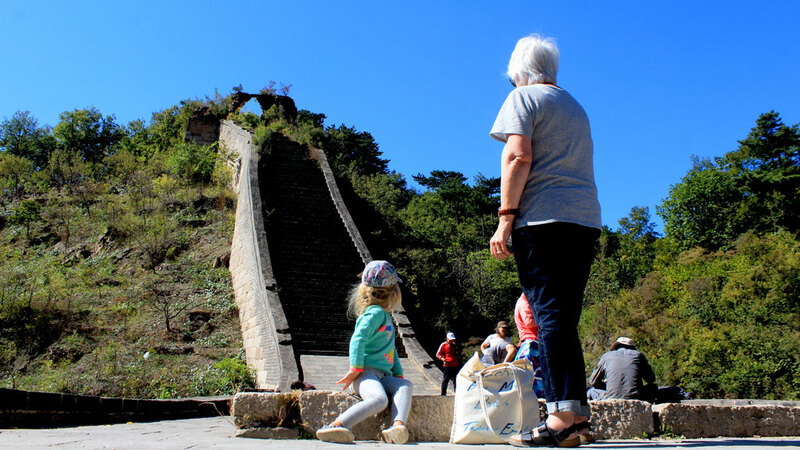 Explore around the Great Wall: find leaves, feathers, chestnuts and more; investigate trees and terraces. Explore the Walled Village: walk the narrow lanes of the Walled Village to find courtyard dwellings; climb up on to the walls for views inside. Other: this is a farming area, and we often see donkeys, cornfields, lettuce patches, and farmers working the chestnut orchards. We'll supply a worksheet we made for the Cub Scouts that includes things to do and look out for. Please contact us if you'd like more details about the plan. Safety and supervision: we choose hikes that are not dangerous, and we’ll warn you about any parts of the hike that require extra attention. You’re responsible for watching your children. We’ll let you know where’s good to play. Vehicle: all participants must wear seatbelts while in the vehicle. Ask us about bringing your car seat, as certain seats might not fit. Weather: if the weather doesn’t look like fun, we’ll cancel or postpone the hike. Food: bring your own picnic lunch. We’ll supply some snacks and water for you. It's not really a hike, and we're going to take it slow. If you're interested in a hike, please take a look at some of the other options we have. Level 2 hikes are not too tough: maybe a bit hilly, but no very long climbs. This type of hike will usually be suitable for children – but please check with us if you are not sure. 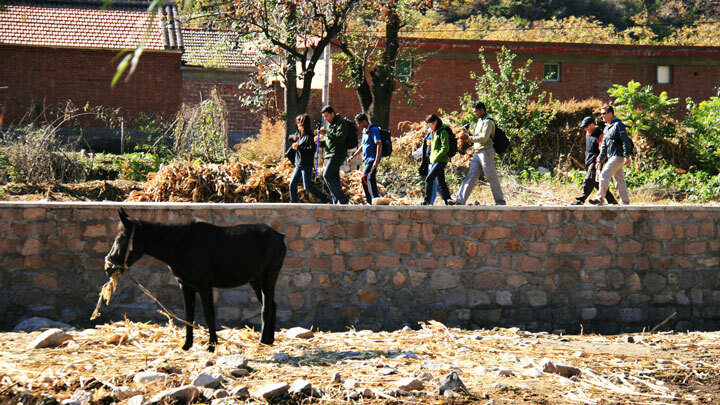 See 28 photos from an easy walk from Zhuangdaokou to the Walled Village. Our hike from Zhuangdaokou to the Walled Village is one of the easiest we have, although there's an option to make it more difficult by exploring the Great Wall mid-way—see 17 photos from an October holiday visit. One of our easiest hikes! See 17 photos from our walk from Zhuangdaokou to the Walled Village. 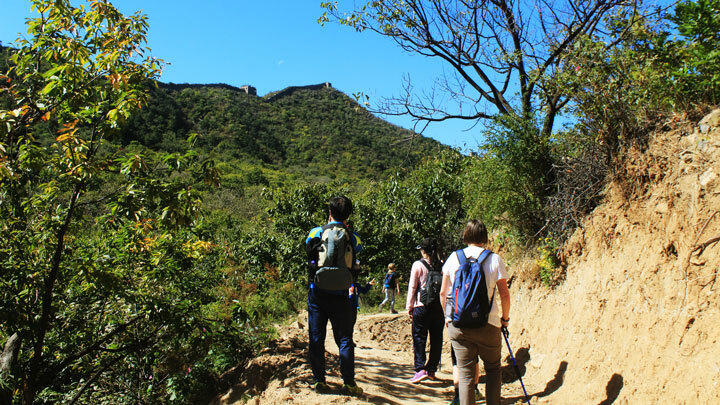 Blue skies, green leaves, persimmons, and Great Wall on our Zhuangdaokou to the Walled Village hike. On this nice and easy hike we walked between two small countryside villages, stopping midway to explore a section of Great Wall. It was a very clear day, and we had excellent views while hiking, especially from high up on the wall. Click through to read a write up and see photos! 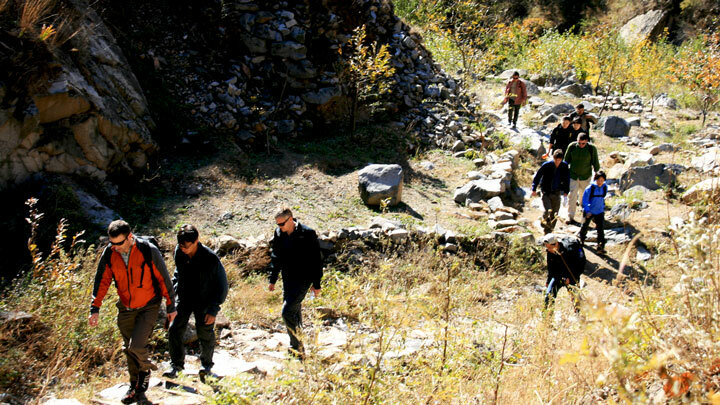 This hike is an easy, relaxing stroll from the village of Zhuangdaokou to the Walled Village, a small settlement that once was home to the Ming Dynasty soldiers who were in charge of the upkeep and guarding of the section of Great Wall in that area. Click through for photos and a write up of the hike.